Ok… not really 101 things to do, but there is SO much going on this weekend! 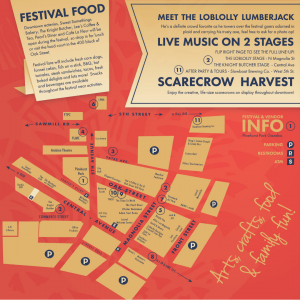 Loblolly Festival is all about arts, crafts, food, and family fun! Here’s the rundown of places to go, drink, eat, and play! Enjoy delicious festival food from the vendors and food trucks that line the 400 block of Oak Street. You’ll find corn dogs, funnel cakes, fish on a stick, award-winning BBQ, hot tamales, steak sandwiches, baked goods and more! Stop by the beverage wagon near the Loblolly stage (near Trustmark Bank) for a cup of Budweiser, Bud Lite, and Michelob Ultra or taste a craft beer brewed locally by Slowboat Brewing Company while you enjoy live music. It is ok to sip and stroll, just stay within the boundaries of the festival, which is the walkable downtown. 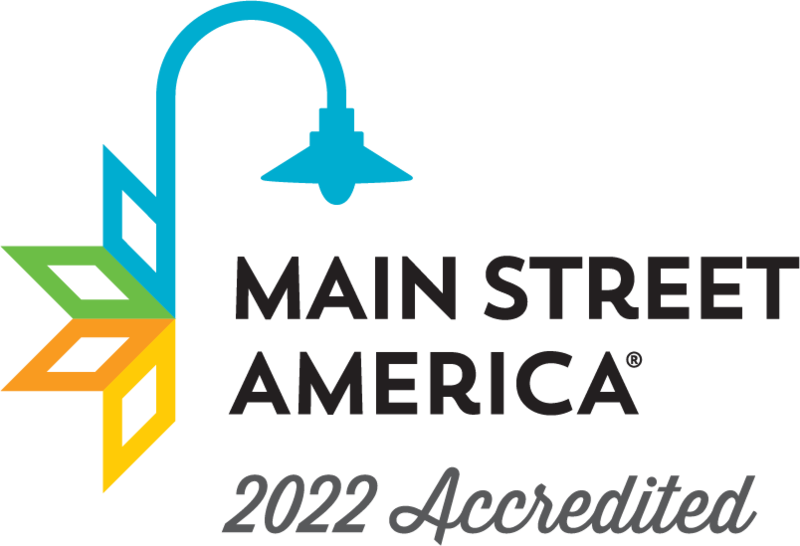 For more information on the sip and stroll ordinance, click here. If food trucks aren’t your style, never fear. Your favorite downtown eateries will be open too! Stop by old favorites such as Café La Fleur, The Loft (dinner only), Lee’s Coffee & Tea, and The Knight Butcher or check out downtown’s newest additions, Sweet Somethings Bakery, Shug’s Cookie Dough and Candy Bar, and The Pearl Diner. 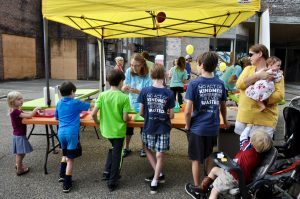 An expanded Kids’ Zone at Loblolly Festival means there’s something to delight and entertain kids of all ages. You’ll find fun jumps, rides, slides, train rides and more! Enjoy face painting, a special craft area at HAND+made and fun learning activities from Central Creativity. On Central Avenue, big kids will get a thrill from riding the mechanical bull, water surfing, and much more! Walk through downtown and enjoy the creative, life-size scarecrows on display as part of our Scarecrow Harvest, a growing yearly competition among downtown merchants. International World Cup champion chainsaw artist, Dayton Scoggins, carves all day near in center of downtown near Mimmo’s. You’ll be mesmerized watching him and observing his attention to detail in every cut he makes! Student artwork painted on Masonite door skins will be on display at the YWCO of Laurel, depicting this years’ theme, “Laurel — the Future IS Ours. ” Be sure to stop in, take a take a break from the heat, and admire Laurel’s talented young artists. Your family will love the annual Heritage Arts Festival at Lauren Rogers Museum of Art! Enjoy FREE music and art activities, FREE pizza and soft drinks at 11:30 a.m. While you’re at the museum, stop in to see their current exhibit, DaVinci’s Machines, on display through November 11th. Laurel First United Methodist Church will host their annual Pumpkin Patch fundraiser during Loblolly Festival. The Pumpkin Patch will be open from 12-6 p.m. on Saturday, October 6th, on the front lawn of the church. Purchase a great pumpkin and support the student ministry of FUMC! Enjoy live music on the Loblolly Stage located on North Magnolia Street, near Trustmark Bank. 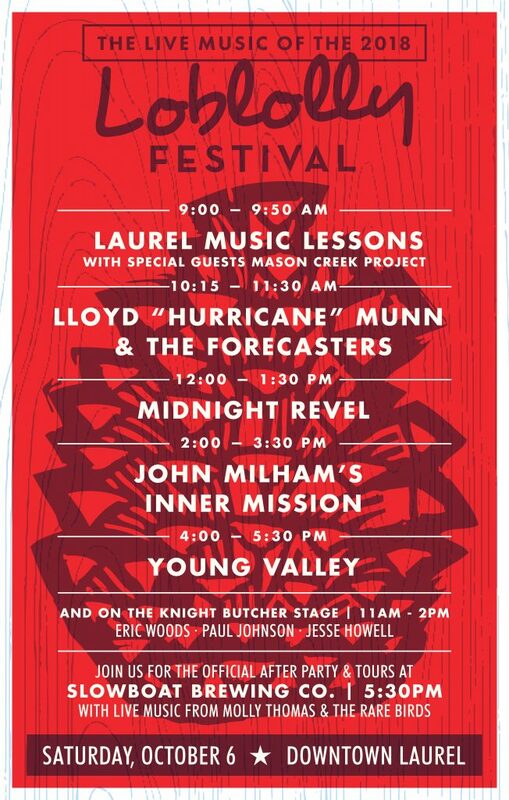 The Knight Butcher Stage on Central Avenue will also host live music throughout the day. And don’t forget to join us at the Official Loblolly Afterparty at Slowboat Brewing Company beginning at 5:30pm with live music from Molly Thomas The Rare Birds! Meet the Loblolly Lumberjack, a definite crowd favorite as he towers over the festival goers adorned in plaid and carrying his trusty axe. Geo-cachers, check your websites and join the hunt for special treasure hidden in historic downtown Laurel! Stop by the Gazebo at Pinehurst Park for any information you may require during the day’s event. Remember, all Laurel Main Street events are rain or shine so plan accordingly! 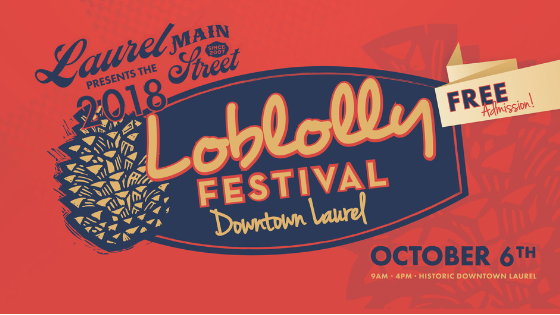 With so much to see and do downtown this weekend, you’ll want to commemorate all the fun you had, so be sure to visit the Laurel Main Street trailer during Loblolly Festival and purchase an official Loblolly t-shirt!